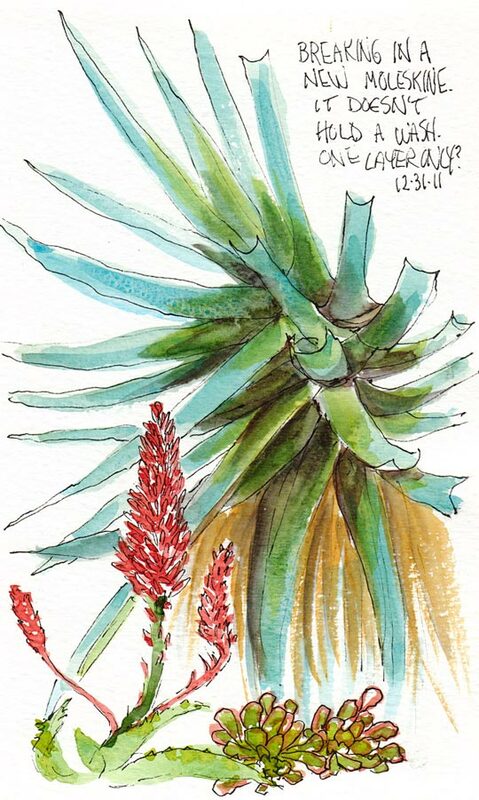 Succulents Along the Walk, ink & watercolor, 7x5"
To shake things up a bit I thought I’d try a watercolor Moleskine watercolor sketchbook this time instead of binding a new journal. These sketches are the first in the Moleskine from a walk in my neighborhood on a sunny winter day. A few spreads into the Moleskine, I’m liking the paper but hating the stupid, floppy, too-wide landscape format. Why, oh why does Moleskine refuse to bind a watercolor book on the long size in portrait format! Brenda Swenson had a clever solution: she bought a very large watercolor Moleskine and sawed off half to make one the right size! Here’s someone else who had hers sliced at the local photocopy shop. 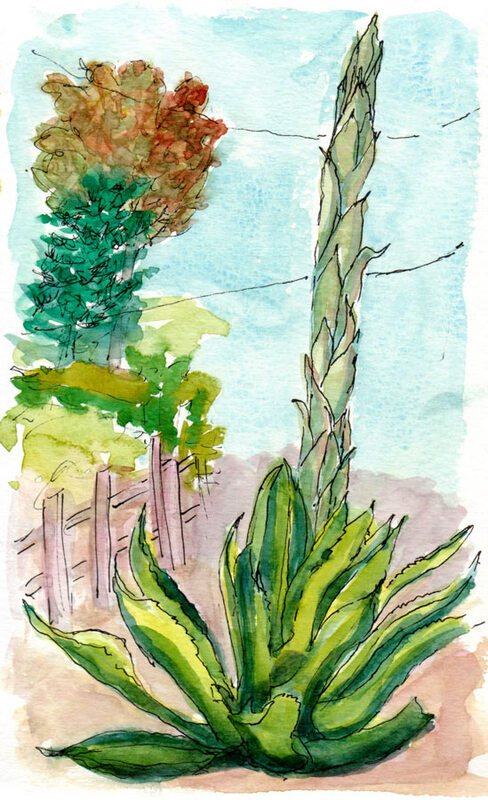 Succulents 2, ink & watercolor, 7x5"
The spike on this plant was about 15 feet tall but I didn’t think through how to make it look that way, and since it was in ink, it is what it is. The stalk should have gotten skinnier as it got further away instead of looking like a fat asparagus. I’m always interested to see what you’re doing! So if you turn the moleskin 90 degrees you have portrait format, right, or is it still too long? I guess if it were that simple you’d have done it!!! But I like what you’ve done in this book and look forward to see how you fill it….probably not with snow like we’re having today ! There has to be some way to contrast the height of the “asparagus” with an ordinary small object so the great height is appreciated…i’m thinking about this. I have a photo of a “century plant” I had in Arizona that I might want to paint/draw/whatever someday…such an interesting plant, I’d want to do it justice! Yes, you’re right, and I tried to do that with the trees on the back left and the telephone wires which just look like odd lines across the page. If I’d have put more thought to it I could have put in an actual telephone pole or turned my view so that the tall apartment building behind it was in the picture. But I would have had to cross the street to do so and a parked car would have been in the way. It is a really interesting plant. Is it called a Century plant because they only bloom every 100 years?